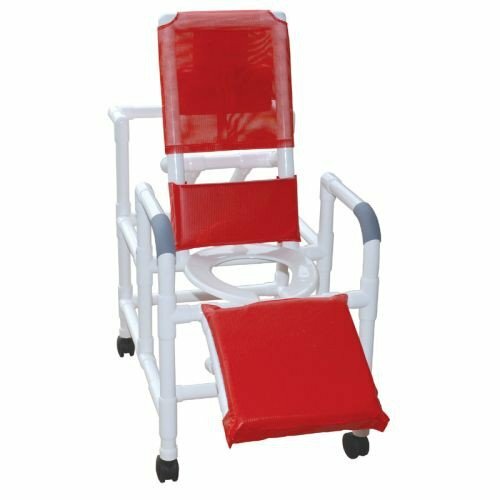 MJM PVC Reclining Shower Chair, by MJM International, is a deluxe, economical shower chair, which is a great choice for showering patients with special needs. The chair easily reclines so you can relax, adapt, and lounge like a boss while you shower, all while maintaining the most comfortable position, ensuring that showering is as stress-free as possible. The arm rests conveniently allow you to raise and lower the seat when needed. MJM PVC Reclining Shower Chair features threaded stem casters and anti-slip handgrips for ease of mobility. Constructed of healthcare-grade PVC with reinforced stress areas for ultimate durability. Available in three stylish colors. Vitality Medical also carries other shower commode chairs, like the Invacare All-In-One Aluminum Commode and the MJM PVC Shower Chair with Deluxe Elongated Open Seat. Reclining Shower Chair with Deluxe Elongated Open Front Seat and Elevated Leg Extension. Padded Lumbar Support and Head Section. Does this item come with a commode bucket? This item does not come with a commode bucket.